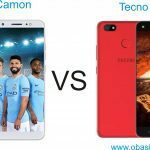 Home » Mobile Computing » android » Tecno Camon Vs Spark Series: Which gives the Best Price vs Features? In the past, we’ve written about the features of Tecno Camon, but would like to compare same with Tecno Spark series. This is because a lot of Tecno fans do ask this question and I have decided to give my perspective, verdict and tech advice on the best Tecno series to choose between the two. The chief details I’ll be taking into consideration is the; stand-out features, specifications and special enhancements that comes with either of these (Camon/Spark) product line. The Tecno Camon series boasts of smartphones with affordable prices, stunning cameras, lovely music experience and decent-enough battery life. Camon CM, Camon CX, and Camon CX Air are the latest smartphones from this series and they’re all earning great impressions plus sales in the mobile market. These three Tecno smartphones have some things in common especially the Tecno Camon CX and CX Air which are like twins in feature-specs. They all come with wide-screen display size ranging from 5.0″ and above, also, their screen resolutions is good and acceptable. Tecno Camon series feature a super bright screen display; you can see clearly through their screen. Apart from the older smartphones (Camon C7, Camon C8, and Camon C9) in this series, the recent ones (which I’m considering in this article) pack 2GB of RAM and also good GPUs for smooth gaming and multitasking. The default internal memory capacity of smartphones from this category is usually 16GB but they can be further expanded up to 128GB via MicroSD cards. Like I said earlier, the Camon smartphone series are widely known for packing good cameras, they seem to have the best camera quality than the other Tecno series. Interestingly, these smartphones run on Android Nougat OS (7.0) coupled with Quad-Core or Octa-Core MTK processors for seamless device operations. The battery capacity of these short-listed smartphones are quite encouraging. They’re all equipped with 3000+mAh battery capacity with quick charge technology. There are only two smartphones in this category – the Tecno Spark K7 and Spark Plus K9. They are both premium devices and comes with the latest mobile technology feature enhancements. Spark k7 and Spark Plus K9 both have a sleek elegant body design and comes with a slim body built. The camera quality of this duo is superb and jaw-dropping. Spark Plus K9 comes with a 6.0-inch screen display size while Spark K7 flaunts a 5.5-inch HD screen display size. The screen resolutions of these devices are great; it displays crystal-clear images and stunning graphics display when playing games. The duo packs a 2GB of RAM, but some Spark K7 variants come with 1GB of RAM and the GPU quality is good as well. It’s a perfect smartphone for gamers as one can multitask for a whole day with any of them. Coming to the internal storage capacity of these smartphones, they are both expandable up to 32GB via MicroSD cards but the default memory capacity is 16GB. Well, almost all recent Tecno smartphones come with good, stunning cameras so these two were not left out. They pack 13MP rear cameras and 5MP front-facing cameras plus LED flash. Both smartphones run on Android 7.0 Nougat OS and inside the hood lies an MTK Quad-Core processor for easy and seamless device multitasking. The battery capacity of these short-listed smartphones are quite encouraging. There’s a 3000+mAh battery capacity with quick charge technology. Spark Plus K9 costs N36,000 ($110.00) while Spark K7 costs N32,000 ($100.00). My verdict is based on the above information. Tecno Camon Series is better than the Spark Series, below are my reasons in bullets. Camon CM, CX, and CX air pack 13MP front-facing cameras but Spark Plus K9 and Spark K7 come with 5MP front-facing cameras. The battery capacity of the Camon series is greater in most cases. The differences between the two categories are minor and not very important factors to consider when purchasing a new Tecno smartphone. The Spark series of Tecno smartphones captures stunning images too and can last up-to 48 hours when charged properly. You can also share your own personal views and opinions about this comparison by commenting on this post.